In the Victoria Street, Central City studio, we now have a 'Body Composition Analyser'. 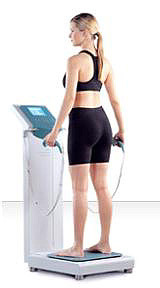 This will measure Body Fat (%), Body Density (KG), Edema (fluid) plus 24 other composition ratings. This is a $35,000 machine that will cost you only $15 to use, with a printout that you can keep! 'Upstanding Tans' has relocated to the Central City studio with 2 HEX stand-up tanning booths. Ergoline Sunbeds both Stand Up and Bed models are available for use at our Takanini studio. Fast tanning sessions, taking only 4 - 12 minutes. Our Pukekohe studio offers the Ergoline sunbeds and Infrared Sauna's with the Eastern Bays studio offering an Infrared Sauna for their customers. To take advantage of these additional services, you do not need to be a Vibra-Train workout customer.